New York Times bestselling and Eisner award-nominated writer Jonathan Hickman (EAST OF WEST, The Avengers) and artist Nick Pitarra (THE MANHATTAN PROJECTS) return to their twisted tale of science and madness with THE MANHATTAN PROJECTS: THE SUN BEYOND THE STARS #1 coming from Image Comics on March 11, 2015. "Nick and I are really excited about the new format," noted co-creator Hickman. "We're looking forward to telling stories that have a tighter scope because then we believe we can really open it up. Do some really big stuff." "I just want to draw Russian dogs fighting aliens," said co-creator Pitarra. "And if I can throw in a few opposable thumbs as well, fantastic!" In THE MANHATTAN PROJECTS: THE SUN BEYOND THE STARS #1, Russian cosmonaut Yuri Gagarin is lost in space—and only now does he find his true calling. With all new stories told in a brand-new format, the greatest feel good, bad science book in the long history of man returns in THE MANHATTAN PROJECTS: THE SUN BEYOND THE STARS. 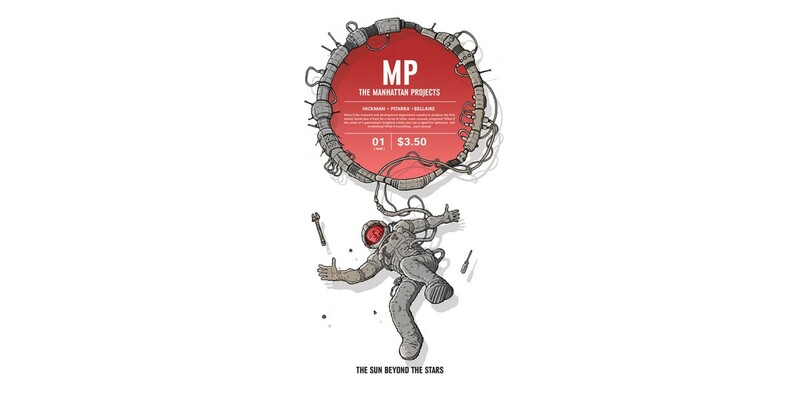 THE MANHATTAN PROJECTS: THE SUN BEYOND THE STARS #1 (Diamond Code JAN150586) blasts off on March 11.